This leisure sport gained its recognition in the year 1970 when it was included in the Munich Olympic Games . But it was first journalized by the Lieutenant John Fremont of the U.S. Army in on the Platte River in 1842. Teesta or Tista River starts flowing from the state of Sikkim after being originated from Cholamo Lake at an elevation of 5,330 m. Said as Teesta Khola in Nepali, it is often refered to as the lifeline of Sikkim. This green river after being joined by River Rangit forms the boundary between the states of Sikkim and West Bengal. Rangit on the other hand originates in the Himalayan mountains in West Sikkim district. Being perennial river, it is fed by the melting snow of the Himalayas in early summer, and the monsoon rains in July-August. At Teesta Suspension Bridge, which joins Kalimpong with Darjeeling, Teesta river is met by its the said Rangeet River, its main tributary,. At this point, it changes course southwards flowing entirely into West Bengal. The river hits the plains at Sevoke, where it is spanned by the Coronation Bridge which links the north east states to the rest of India. The river then courses its way to Jalpaiguri and then to Rangpur District of Bangladesh, before finally merging with the mighty Brahmaputra at Fulchori. One can see the clear color difference at the confluence of the these two rivers even from Jorethang hill top point. The confluence area is also a very popular camping site for rafters. Owing to its turbulent waters, Teesta offers an exciting experience of rafting to enthusiasts. Teesta river has been graded on the International scale at Grade 4. The icy cold waters of this tortous river have a series of rapids with varying intensity, difficulty level and character. It offers one of the finest rafting stretches in India. The Rangit has more turbulent waters. 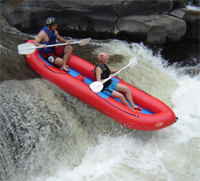 With its multi-dimensional rapids, it offers a challenge to even experienced rafters. On both the rivers, the riverbanks have deep forests, with beautiful small villages here and there and some patches of terraced cultivation around these villages. Plenty of white sandy beaches exist, offering very good campsites. So, often tourists prefer to combine rafting with trekking and camping to make the experience even more enjoyable. Sighting of several varieties of fishes is added feature. You can choose any time except monsoon particularly July to September. During October and November the rivers are still swollen and the rapids are less. The most recommend period is December to June. •	You must be physically and mentally fit for undertaking the adventure sport of white water rafting in Sikkim. •	You are advised to always carry necessary prescription medicines such as insulin, inhalers, bee-sting kits etc. •	While you are going on a rafting expedition, avoid carrying your car keys, wallets, mobile and other valuables as you might loose them. •	Always remember to carry dry bags or boxes to secure small items of personal use that you may bring with you. •	Also take along goggles, sunscreen lotion and a still-camera, with a strap to secure these items. •	While rafting, avoid cotton clothing (except in summer season), as cotton clothes will take away warmth from your body. Wool, polyester fleece and other synthetic materials will keep your body warmer and they will dry faster than cotton clothes. •	All the rafters are required to sign the assumption of risk and release bond before undertaking the trip at Teesta River. •	All foreign clients are to carry their passport and visa, which will be registered at the Teesta Bridge & Rangpo while crossing. • If you want to carry your Camera while you will be rafting, ensure that you carry a waterproof arrangement as the water splash can damage your Camera and also do not forget to carry a wrist strap in that case. This entry was posted on Tuesday, March 2nd, 2010 at 10:43 am	and is filed under General. You can follow any responses to this entry through the RSS 2.0 feed. You can leave a response, or trackback from your own site. A bit unorganised, but every bit enjoyable and thrilling.